The campsite has two different kind of fields, the motorhome field and the family field. 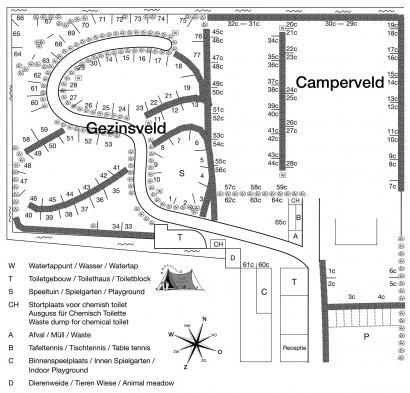 The motorhome field (camperveld) is located on the right side of the campsite. The field consists of two major straight fields and has a number of places behind the soccer goal. The hard ground is ideal for motorhomes. From June also caravans and tents can stay at the motorhome field. When there is enough space, you can park your car beside the caravan or tent. The family field (gezinsveld) is located on the left side of the campsite. The field consists of several smaller fields and has an interesting layout. The playground is also on the family field. The family field is suitable for caravans or tents. Your car can park on the path. Motorhomes are not allowed at the family field, the can stay at the motorhome field. At the whole campsite there is 6 amps electricity. The toilet block is located 1 minute walk away and easily accisseble. Dogs are permitted on condition that they are leashed. You have to walk the dog outside the campsite. We have no place for motorhomes longer than 8.00 meters or caravans longer than 7.50 meters. As a result, we also have no place for caravans with a tandem axle.